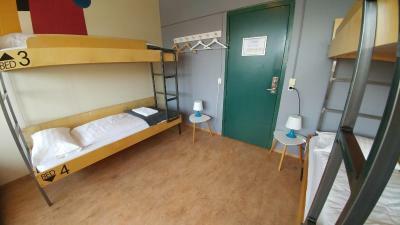 Lock in a great price for Borgarnes HI Hostel – StayWest – rated 8.3 by recent guests! 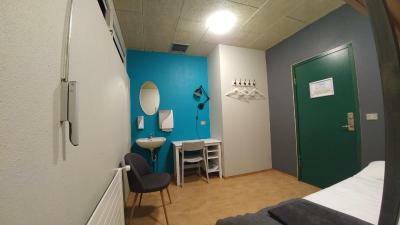 For a hostel it was pretty clean and modern, my private bathroom could have been a touch cleaner, but for the low cost, it did the job. 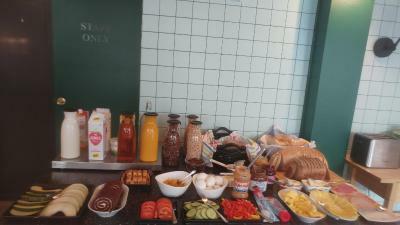 There were 3 well equipped kitchens and free coffee in the morning. Says Laundry as an option but you have to pay for it (1,000isk per load). 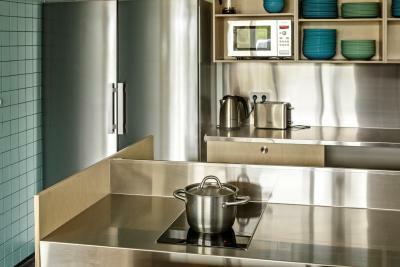 The stove can be a little tricky, won’t turn on if you’re using the wrong pots/pans (read the instructions in kitchens). 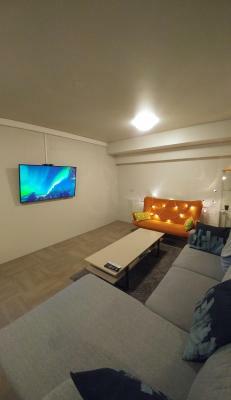 The living room area is pretty cool, has a big flat screen TV with Netflix, if there isn’t a lot of ppl around making noise, it’s a nice touch to watch a movie! It had everything we needed - own private washroom, clean kitchen, and free parking. 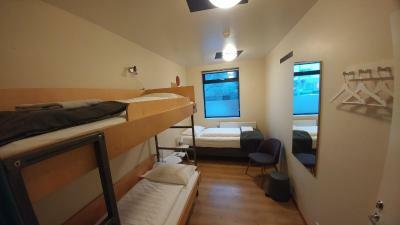 Hostel is very clean. 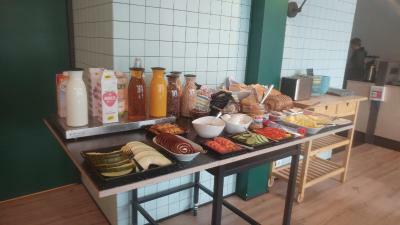 Communal Kitchen has everything you need. Parking is convenient. 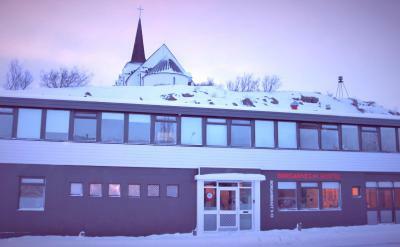 We loved staying at Borgarnes Hostel. It was an easy check in. 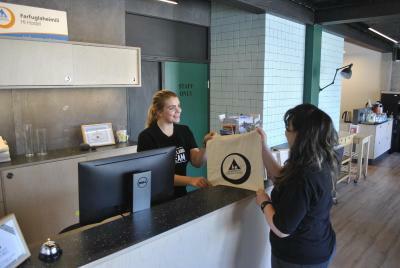 The staff member who was at the desk was very helpful and kind. 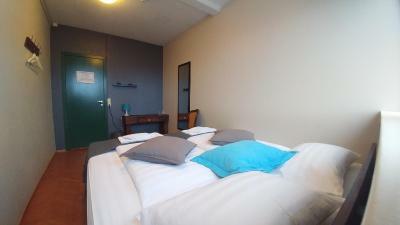 The rooms were perfectly adequate and comfortable. Very clean. 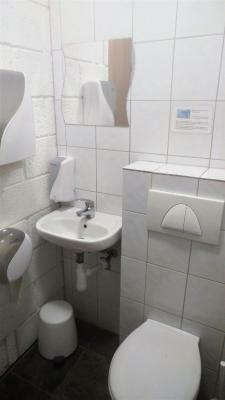 The downstairs facilities (kitchen, eating area) were well above what I expected. My daughter loved putting on the slippers at the door and thought the bunkbeds were great. Very great value! 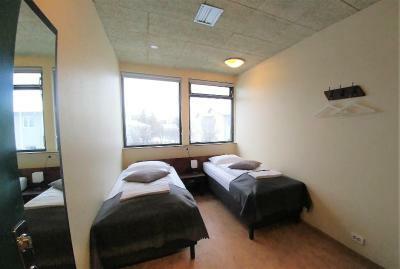 The dorm was comfortable with an all-female option upon booking. Larger kitchen area and good dinning area. Parking in front of the building, no elevator, but that was mentioned before the booking. 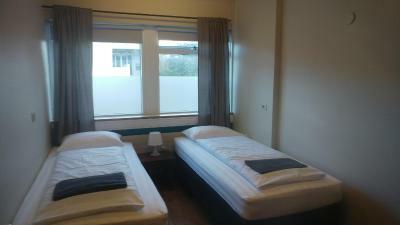 The room was very nice and clean, we were satisfied! 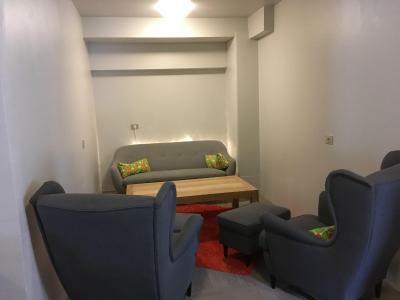 Quiet area, with good amenities such as the kitchen. Convenient location in this small town. 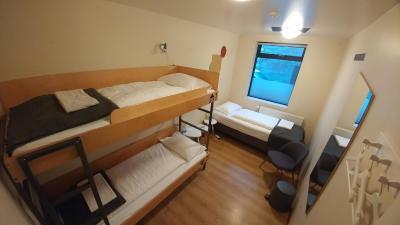 Clean rooms, decent facilities. Nice large common area/kitchen. 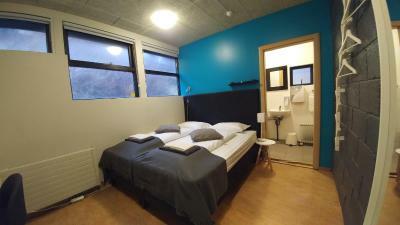 Pretty good hostel! 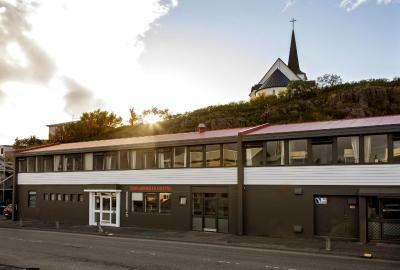 Located next to Skallagrimsgardur Park in central Borgarnes, this eco-certified hostel offers free parking and free WiFi access. 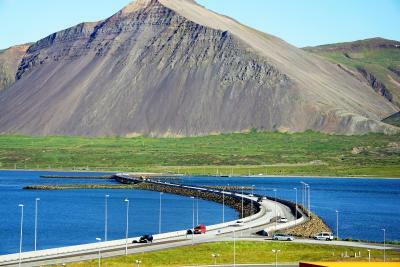 The thermal spa, hot tubs and swimming pools at Borgarnes Sports Center are 650 feet away. 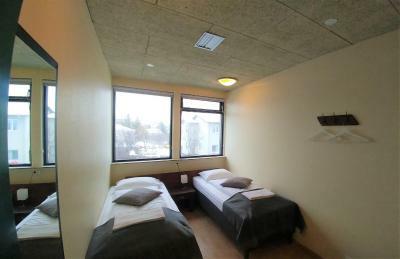 Rooms at Borgarnes Hostel have either shared or private bathrooms. 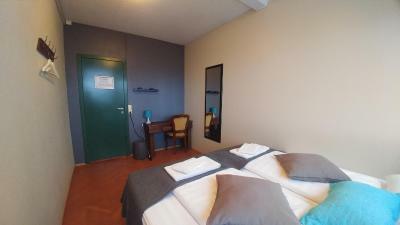 Each room is heated and brightly decorated. 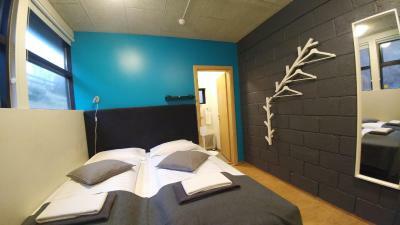 A common living room with TV and a dining room are accessible to all guests at Hostel Borgarnes. 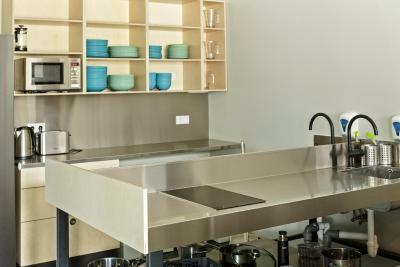 Meals can be prepared in the 3 fully equipped shared kitchens. 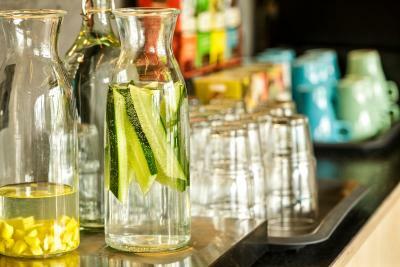 Restaurants, cafés and grocery stores are found within a 10-minute walk of the hostel. 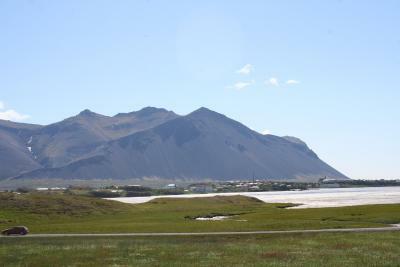 Hamarsvollur Golf Club is 2.8 mi away. 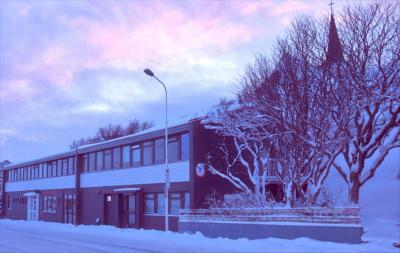 Reykjavik city center is a 1-hour drive from the hostel. 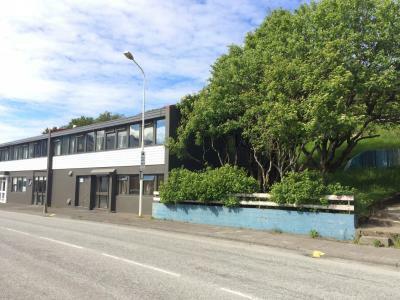 When would you like to stay at Borgarnes HI Hostel – StayWest? 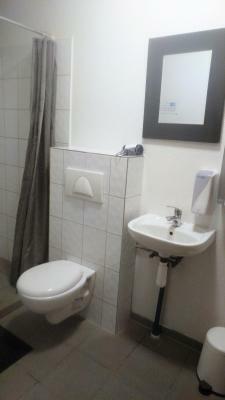 Brightly decorated room with a desk and private bathroom with shower. 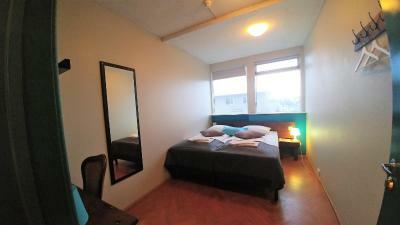 Brightly decorated room with access to shared bathroom and kitchen facilities. 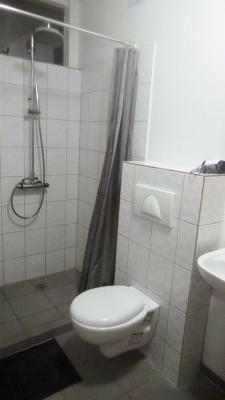 Brightly decorated room with a private bathroom with shower. 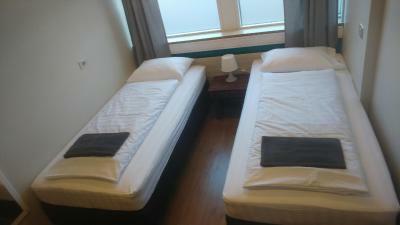 This bed is in a brightly decorated room with access to shared bathroom and kitchen facilities. 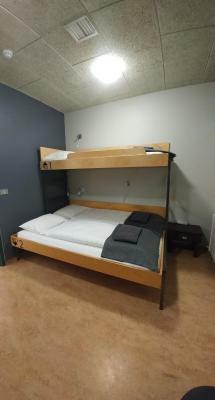 This bed is in a brightly decorated room with access to shared bathroom and kitchen facilities. Only female guests are allowed in this room type. 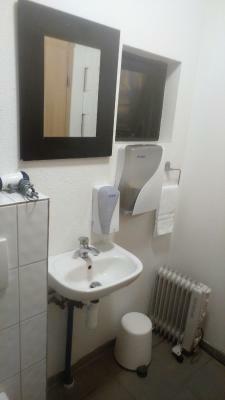 This triple room comes with an in-room sink. Bathroom facilities are shared. 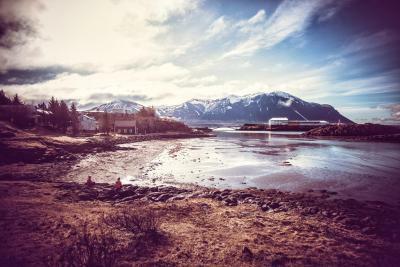 House Rules Borgarnes HI Hostel – StayWest takes special requests – add in the next step! 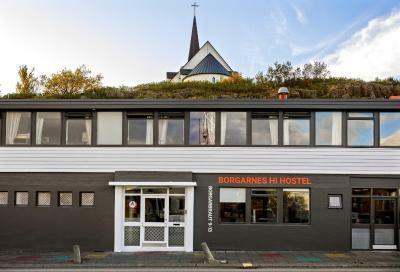 Borgarnes HI Hostel – StayWest accepts these cards and reserves the right to temporarily hold an amount prior to arrival. 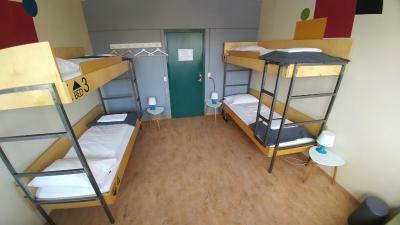 After booking, you will receive check-in instructions from the hostel via email. Please inform Borgarnes HI Hostel – StayWest of your expected arrival time in advance. You can use the Special Requests box when booking, or contact the property directly using the contact details in your confirmation. Excellent diy concept, with easy check in and check out. Placed in the center of the town. And free coffee. The beds are not good at all. After taking a nap for 15 mins my shoulders hurt for 2 days days ( I am a fit person and 25 years old ). I slept on the floor instead of that bed. The beds are not 'healthy' to sleep in and they should be changed. The room smells humidity and we had to open the window to sleep in it. Good location - easy to find. The regular hostel not new but clean. We were lucky to be alone but with "full house" I would be afraid of overcrowded kitchens/bathrooms. Clever system of late check-in, well equipped kitchen, sulphur in the water. 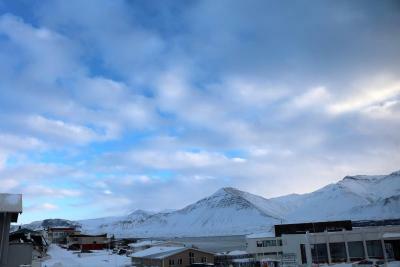 Great location, good place to stay a night on way to the Snae Peninsula. Free Coffee and Tea. Clean. 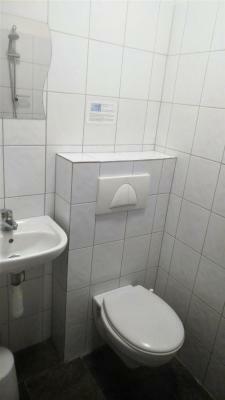 The sulfur smell of the hot water from the bathroom seeps into the hallway which can be a turn off. Everything was relatively clean, but there were things that could have been cleaner. The kitchen and dining area was slightly crowded with chairs and tables like in a dorm common room. All in all, good place for the money, especially the room itself. It was a good place for the fair price. 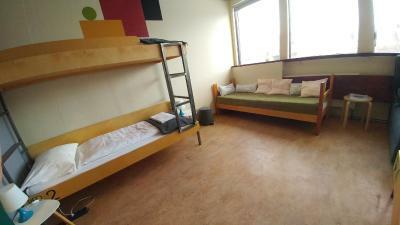 Exceeded my expectations of a hostel by a fair deal. 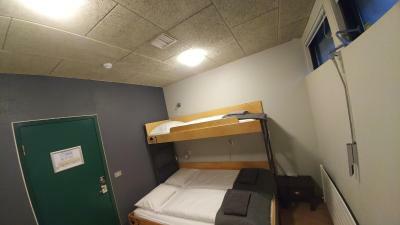 As we were travelling on a budget regarding accommodation, it was more than what we expected to get for the price we paid for. 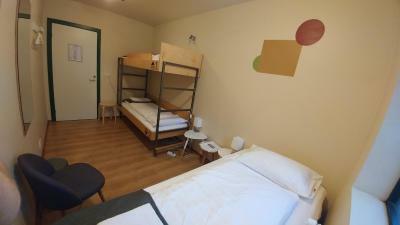 The hostel was really nice and clean, the kitchen was well-equipped. You have to take off your shoes when you enter the building, but there are slippers you can put on. Check in is really easy, keys are waiting for you at the desk. 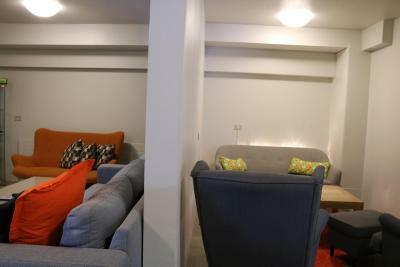 There’s also a really cool shared living room area with a big sofa and a TV. The place is close to the ocean. There are some bikes which you can use free of charge, we really liked that! The offered free supplements like coffee were almost never available :-) . . . . The place is without shoes which is a good idea. But, the floor should be clean then. The bed matrace was fine. Service / offering relation is good. 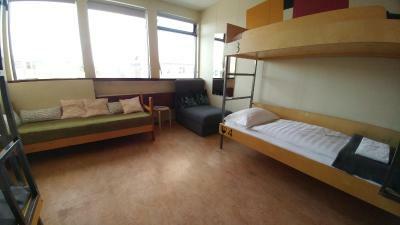 Clean hostel with good kitchen faciities. There could be more bathrooms. 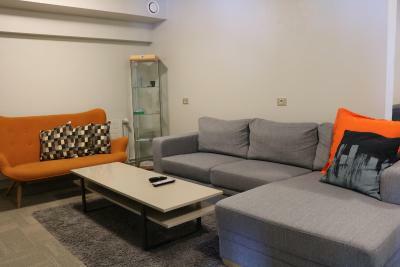 If the place is fully booked out, there might waiting time at the morning/evening "rush hour"
Very tidy rooms and a very well-equipped kitchen. Personal friendly and helpful.